Albert Namatjira was Australia’s most iconic Aboriginal watercolour artist and the first to achieve commercial success, but his story is hardly known. Spend a day at Riverside comparing texts with our Namatjira playreading and documentary screening. This unique opportunity to further explore the play and the man will prove invaluable for your students. The moving story of Albert Namatjira (1902 – 1959) resonates today as strongly as it did 50 years ago, providing a lens through which we can see the relationship between Aboriginal and non-Aboriginal Australians past and present. Directed by Lex Marinos and featuring a cast of professional actors including Trevor Jamieson (Namatjira, Coranderrk and soon to star in The Season), this rehearsed playreading celebrates the legacy of one of Australia’s best loved artists. Almost 60 years after Namatjira’s death his family are seeking to regain copyright of his works. Together with the Namatjira family and art and social justice organisation Big hART, filmmaker Sera Davies takes you on a journey from the sun-blasted deserts of their Aranda homeland to the lavish opulence of Buckingham Place. An extraordinary firsthand account of the international battle to reclaim the artwork and heritage of Albert Namatjira. Daytime sessions of the documentary feature a post-screening Q&A with Sophia Marinos (Big hART Producer). Please Note: The playreading on Tuesday 6 March at 10am and documentary screening on Tuesday 6 March at 1pm have been cancelled due to unforeseen circumstances. Box Office is currently contacting patrons booked into these sessions to offer and exchange or refund. As a current curriculum text for English that remains on the prescriptions for 2019 onwards, we thought this rarely done production needed to be given a new life beyond the page. The timing was brilliant, being that a documentary on Namatjira has just been released, made in conjunction with BIGhART, the producers of the original theatre production. This combination will give students an excellent context for studying this play. Lex attended University of NSW, receiving a BA with Honours in Drama, and also studied with renowned American acting teacher, Stella Adler. Since then he has worked in all areas of the entertainment industry as an actor, director, writer, broadcaster and teacher. As an actor has appeared with the Nimrod, APG, Sydney Theatre Company, Melbourne Theatre Company, Company B, Big hART, and at many arts festivals, as well as commercial productions such as the King and I. Best known on television for Kingswood Country and The Slap, has also had continuing roles in City West, Embassy, S.C.O.O.P, Live & Sweaty, Ballzup, World Series Debating; Strictly Dancing, and Late Night Legends. Films include Cathy’s Child, Goodbye Paradise, Last Days of Chez Nous, Bedevil, Backyard Ashes and numerous short films. Since the riotous inception of 2JJ, Lex has also worked as a radio presenter on various ABC and commercial networks. As a director Lex has worked in all media, notably films An Indecent Obsession, television series Bodyline, Embassy, A Country Practice, plus documentaries. He co-founded the King O’Malley Theatre Company and has directed many shows for commercial and subsidised companies and festivals. Director of Carnivale, NSW’s multicultural arts festival, 1996-99. Lex directed one of the segments of the Sydney 2000 Opening Ceremony, and was Executive Producer, YEPERENYE Federation Festival, which took place in Alice Springs as part of Centenary of Federation Celebrations. Awarded OAM for services to the performing arts, Lex has also held many advisory and governance positions with arts and cultural organizations including SOCOG, The Australia Council, and Community Broadcasting Foundation. Lex is a frequent speaker and writer on arts and cultural diversity; hosts numerous awards and community functions; and is guest tutor at several Theatre & Screen colleges. Trevor is a Spinifex man from the western desert of Australia and is a talented actor, didgeridoo player, guitarist, singer, dancer and storyteller. His family was among those displaced by nuclear tests in Maralinga, roaming the outback until they reached the goldfields of Western Australia. Trevor received Best Actor Award at the 2008 Sydney Theatre Awards for his performance in Ngapartji Ngapartji, for which he also received a 2008 Deadly Award. 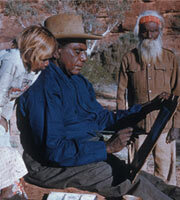 He was nominated in the 2010 Awards for his leading role in Namatjira. 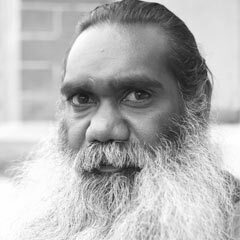 Trevor has worked on the Namatjira Project since mid-2009, consulting with the Namatjira family to gain permissions, engaging in the community development aspects of the project as a key mentor, and playing the lead role in the stage play at 41 venues around the country and internationally. Trevor’s theatre credits are extensive and include: The Season, Secret River; As You Like It; Corrugation Road, Bran Nu Dae, Burning Daylight, King for This Place. Soon to be seen in the upcoming remake of the classic Australian film Storm Boy playing the iconic character Fingerbone Bill, made famous by David Gulpilil. Trevor’s other screen credits include: Cleverman, Secret River, Bran Nue Dae, Rabbit Proof Fence, Kulli Foot, Nothing Rhymes with Ngapartji, Lockie Leonard, Wildcat Falling, Subi Shorts, Deadly Yarns Series 2 & 3. Mathew is a Wongatha man from the Goldfields (region) of Western Australia. 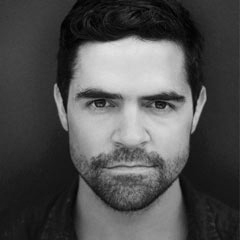 He graduated from WAAPA in 2012, with both an Advanced Diploma in Performing Arts for Acting, and a Certificate IV in Aboriginal Theatre. He has since been seen both on stage and screen, as well as working with school-aged children to devise and develop performance. Stage appearances include Stolen for National Theatre of Parramatta, Lucky for MTC/Neon, and the Belvoir Street Theatre / Ilbijerri Theatre Company co-production Coranderrk. 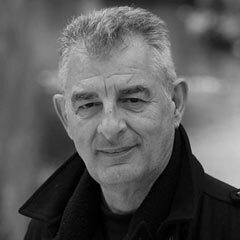 He has performed in multiple productions for Yirra Yakkin Theatre Company, and played the roles of Ian Simpson in Up The Road, Kane in Killer Kane, Theseus in A Midsummer Night’s Dream and Giles Corey in The Crucible during his time at WAAPA. In 2015 Mathew shot his first feature film, The Marshes, a psychological horror film directed by Roger Scott scheduled for release later this year. He has also appeared in numerous short films, including Last Drinks at Frida’s for Magpie Pictures. Mathew played Damo in Blackfella Films’ critically-acclaimed television series screened on ABC TV, Redfern Now, and, more recently, he appeared in series three of Janet King, also for ABC TV. 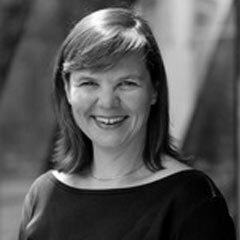 Nicole is a violist/researcher/curator/educator with a 30 year freelance career encompassing historical performance, chamber music, new music/cross-platform work, community cultural development, teaching and orchestral performance. Her credits a vast, and include instrumentalist for the Big hART and Belvoir St Production of Namatjira in 2010. The acclaimed exhibition of legendary master artist, Rembrandt from National Gallery, London and Rijksmuseum, Amsterdam returns to our big screen due to popular demand. Andrea Levy’s Orange Prize-winning novel Small Island comes to life in an epic new theatre adaptation. Captured live on stage in London as part of National Theatre Live’s 10th Birthday, experience the play on Riverside's big screen. A brand new musical comedy featuring famous songs and plenty of laughs. Think Mamma Mia!...but opera!